Alfresco is an open source platform for Enterprise Content Management solutions. ECM includes things like Document Management, Web Content Management, Collaboration/Enterprise 2.0, Digital Asset Management, Records Management, and Imaging. At its core is a repository for rich content like documents, web assets, XML, and multimedia. The repository is surrounded by a services layer (supporting both SOAP and REST) that makes getting content into and out of the repository a breeze, which is why so many next generation Internet solutions are built on Alfresco. This book takes you through a set of exercises as if you were rolling out and customizing the platform for a fictional organization called SomeCo, which wants to roll out Alfresco enterprise-wide. Each department has a set of requirements that need addressed. We will show you how to extend Alfresco to meet these requirements. By the time youжЉіe worked through the entire book, you will be familiar with the entire platform. YouжЉЈl be prepared to make your own customizations whether they are part of a Document Management solution, a web site that uses Alfresco for content storage, or an entire custom application built on AlfrescoжЉЇ REST API. This book will give you the knowledge and confidence you need to make Alfresco do what you need it to do. This book is for Java developers, and you will get most from the book if you already work with Java but you need not have prior experience on Alfresco. Although Alfresco makes heavy use of open source frameworks such as Spring, Hibernate, JavaServer Faces, and Lucene, no prior experience using these is assumed. Jeff Potts leads the industryжЉЇ largest group of certified Alfresco consultants as the Director of the Enterprise Content Management (ECM) Practice at Optaros. Jeff brings over 10 years of ECM practice leadership and over 16 years of IT and technology implementation experience in IT departments and professional services organizations. Jeff began working with and blogging about Alfresco in November of 2005. In 2006 and 2007, Jeff published a series of Alfresco tutorials and published them on his blog, ecmarchitect.com. That work, together with other Community activity in AlfrescoжЉЇ forum, wiki site, and Jira earned him AlfrescoжЉЇ 2007 Community Contributor of the Year Award. The same year, Optaros earned AlfrescoжЉЇ Global Partner of the Year and Implementation of the Year awards. JeffжЉЇ areas of business expertise include document management, content management, workflow, collaboration, portals, and search. Throughout his consulting career he has worked on a number of projects for Fortune 500 clients across the Media & Entertainment, Airline, Consumer Packaged Goods, and Retail sectors. Prior to Optaros, Mr. Potts was a Vice President at Hitachi Consulting (formerly Navigator Systems, Inc.) where he founded and grew the ECM practice around legacy knowledge management, document management, Web Content Management (WCM), and collaboration solutions in addition to custom development. 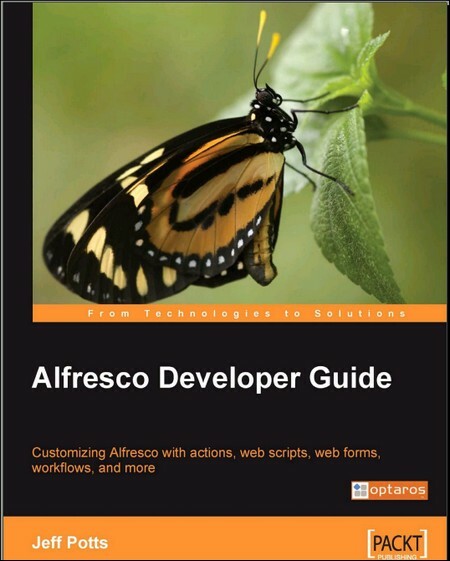 Alfresco Developer Guide Fast Download via Rapidshare Hotfile Fileserve Filesonic Megaupload, Alfresco Developer Guide Torrents and Emule Download or anything related.